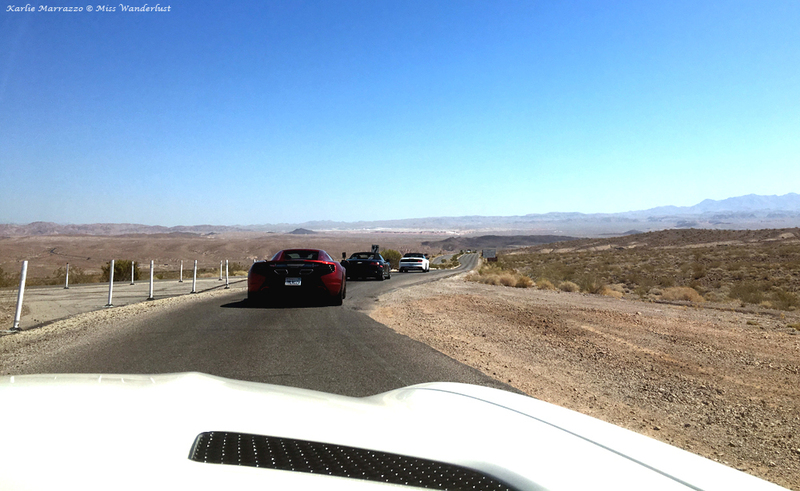 The Silver State was in the middle of an extreme heat wave and it was already a sweltering 34°C (93°F) at 9am on the day of our Exotics Driving Tour. 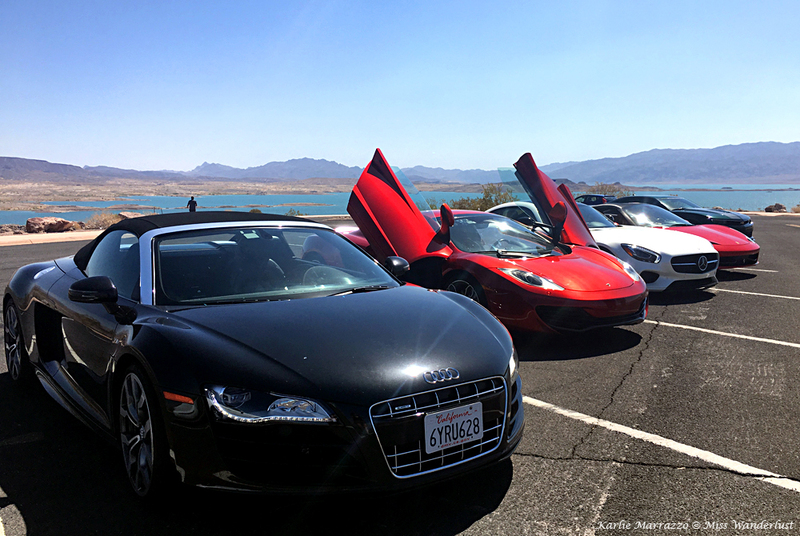 A row of powerful beauties impatiently awaited us in the parking lot of the Exotic Driving Experiences home base on Dean Martin Drive, just a 5-minute drive from the north end of the Strip. We oohed and aahed over a crisp red Ferrari 458 Spider, a masculine Mercedes-AMG GT S, a sleek McLaren 12C Spider and a classic Audi R8. Tony, the manager, took care of our paperwork and went over the pre-drive briefing and safety notes with us before turning us over to Martin, our cheerful tour guide for the morning. 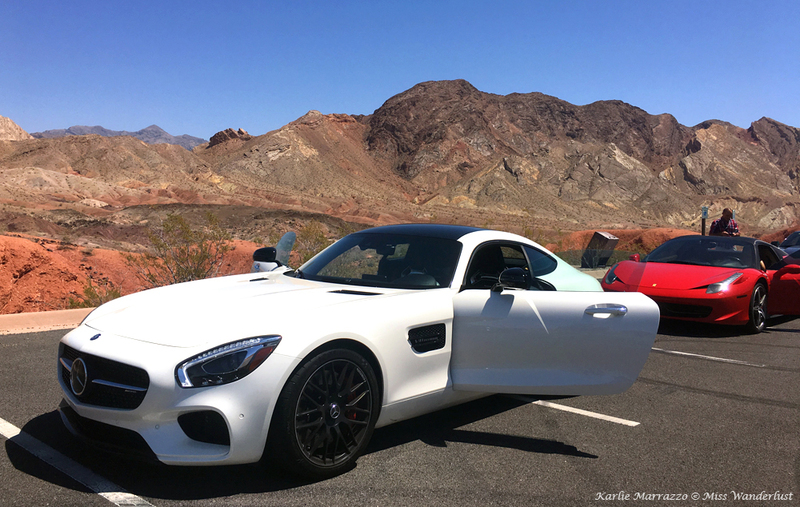 The Mercedes-AMG is a powerful car, and surprisingly the most “affordable” of the bunch at $150,000 CAD for the base model. Even still, gazing upon a car like that, you can’t help but think that you may never own such a car or even get to experience driving one. My travel partner was like a kid in a candy store when he saw it waiting in the lot, and it was the first one he chose to drive. We settled into the low seats and Martin explained the controls before we took off. 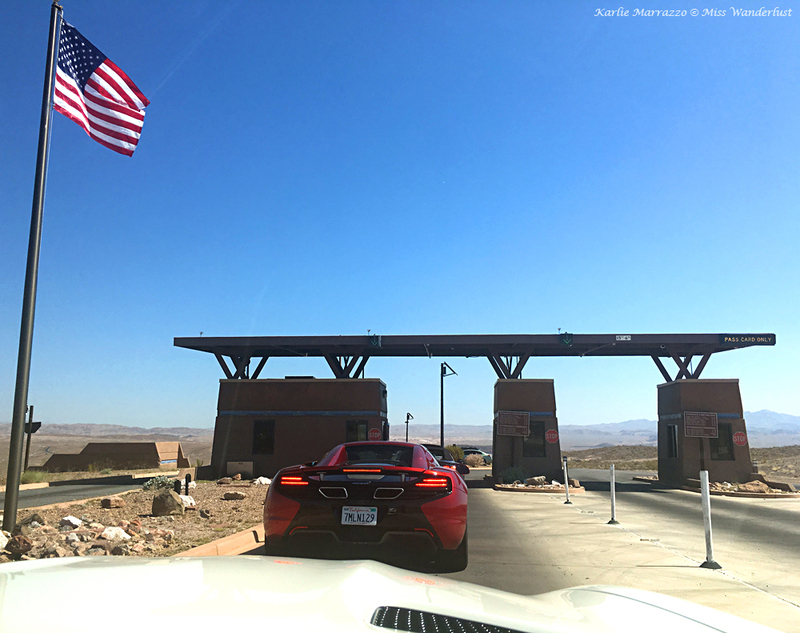 Guests are typically shuttled to a spot at the edge of the city before driving the supercars, but that day we were fortunate to drive them right off the lot, adding more in-car time to our experience. 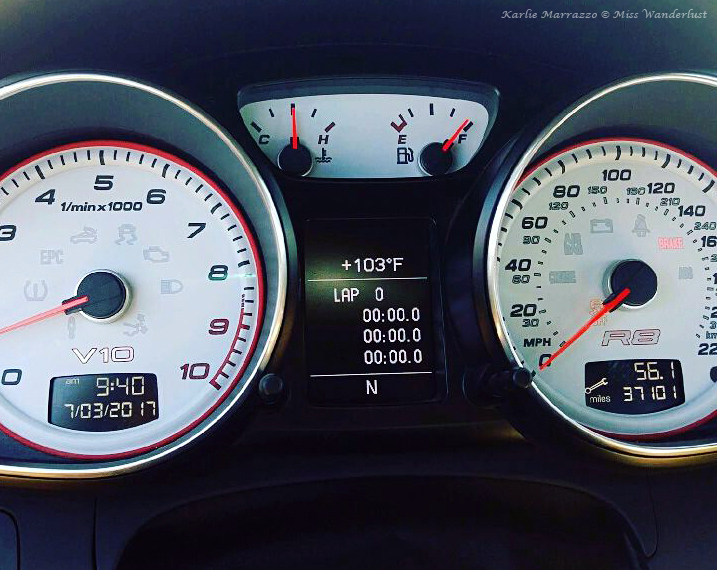 As we got up to speed on the freeway, we felt invigorated by the powerful sounds and the sheer power of the beast. 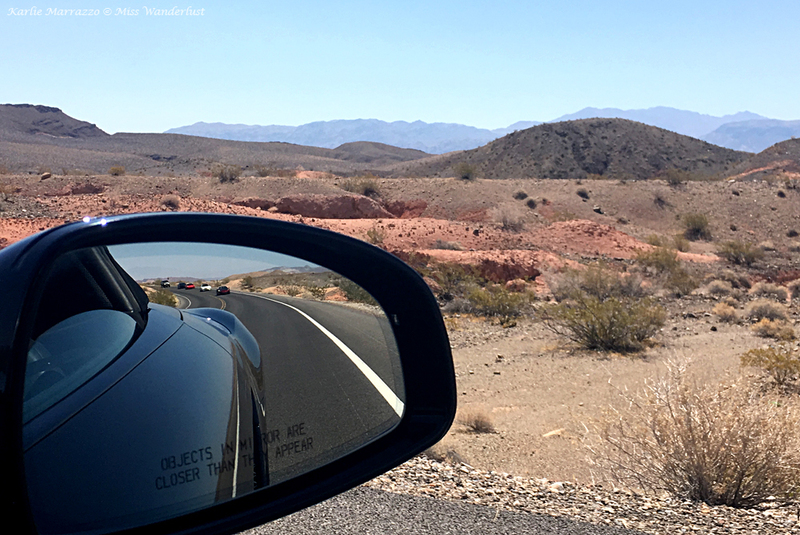 We crossed into Lake Mead National Recreation Area, the black ribbon of boiling hardtop opening up in front of us, hardly any traffic around, the hazy desert spreading out on either side. 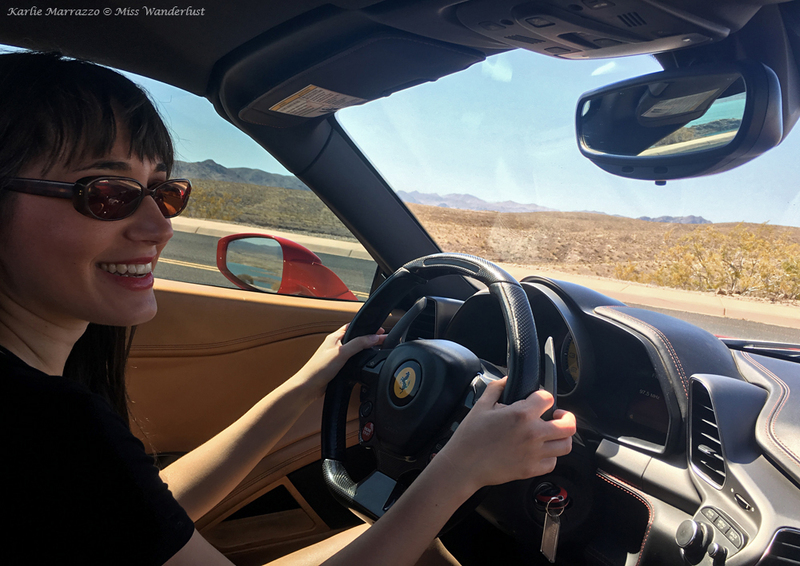 The heat, the sound of the line of powerful cars around us and the surreal desert landscape made it feel like we were taking off in a rocketship. I was surprised by the bright blue water of Lake Mead glistening in the sun like jewels scattered on the desert floor. 30 exhilarating minutes later, it was my turn. I had never driven such a powerful car before, nowhere near it, and now I had the opportunity laid before me at my feet. Paying homage to my Italian roots, I chose to drive the cherry red Ferrari. 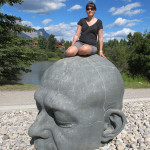 Any nervousness I had melted away as I sunk into the driver’s seat. It felt good. I explained to Martin that I had never driven anything like that before and he made me feel totally comfortable as he told me how to drive the machine. We were off. I had never felt such an adrenaline rush in my life. To know that I was completely in control, and that I was doing it and doing it well, felt exhilarating. I roared through the desert with a grin plastered on my face, the heat of the leather seat making my t-shirt cling to my back. By the time my 20 minutes had passed, I was totally hooked. I didn’t want to stop driving at all. Even now, back at home a week later, every time I drive by a fast car in my little Toyota Yaris, I want to jump out and take the wheel. Our group pulled over at the Sunset View Scenic Overlook. My legs felt like rubber and my hands were shaking slightly when I got out of the car. Blood was pumping hard through my body from the adrenaline rush. After a few minutes of everyone exclaiming over their drives so far, my partner and I opened the rich purple McLaren’s butterfly doors and hit the pavement for another exciting drive. We ended the tour with a short jaunt in the Audi R8 and cruised back into the EDE parking lot. Back at the Exotic Driving Experiences headquarters, Tony debriefed our group and we all chatted about our favourite cars, with the Mercedes and McLaren being the overall favourites, longing for the day we could return and do it all over again. 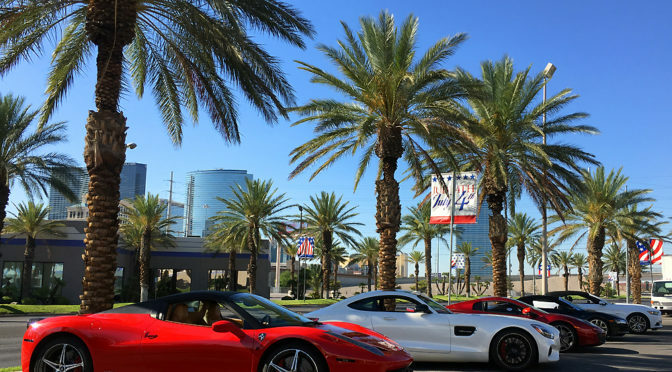 In a city that can give you anything your heart desires, taking to the open desert roads with a bevy of supercars at your fingertips is the perfect way to spend part of your visit to the City of Sin, the ultimate adult playground. 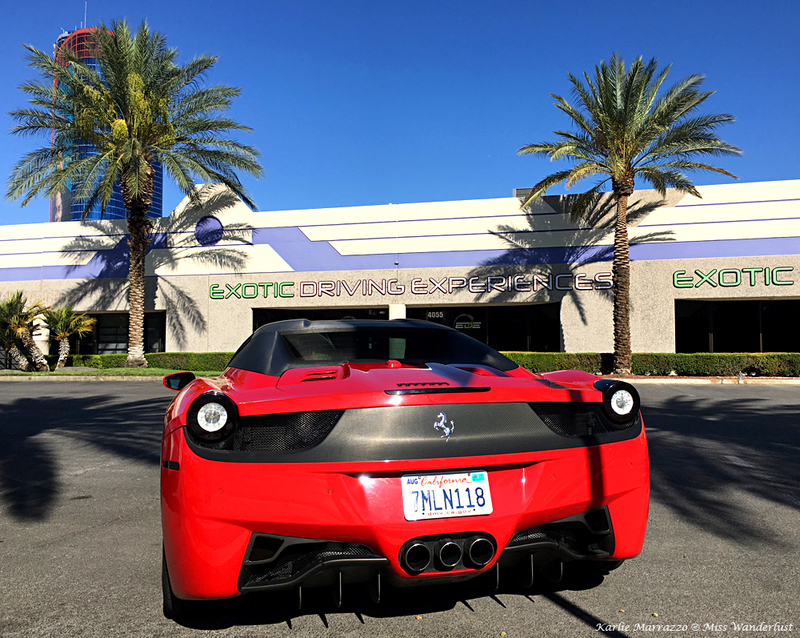 Las Vegas Exotic Car Driving Tour – $499 USD. Add $100 for a non-driving passenger or $150 for one additional driver. Insurance extra. 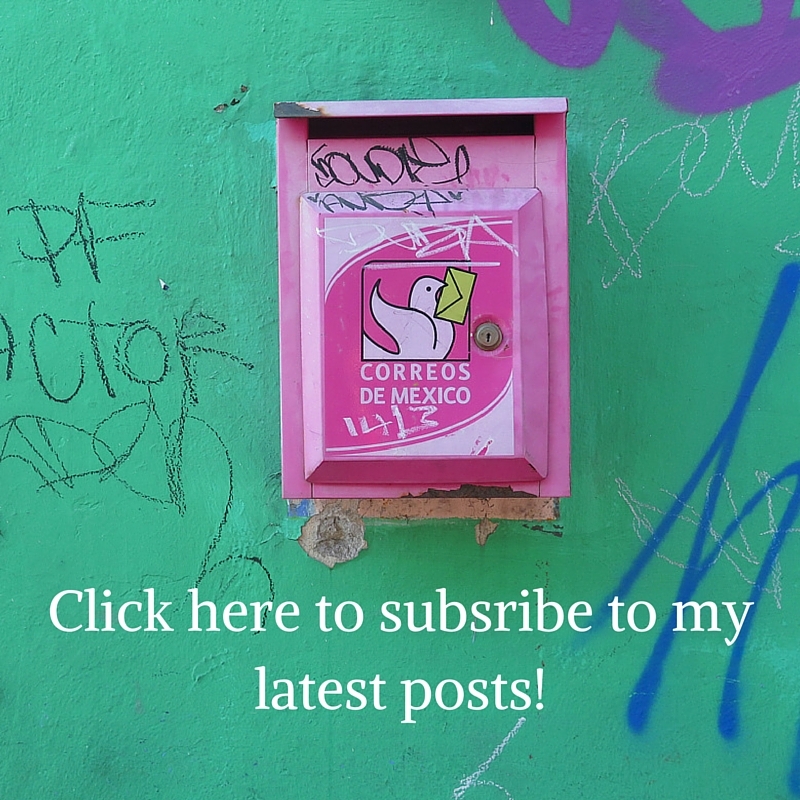 Click here for all of the tour details! 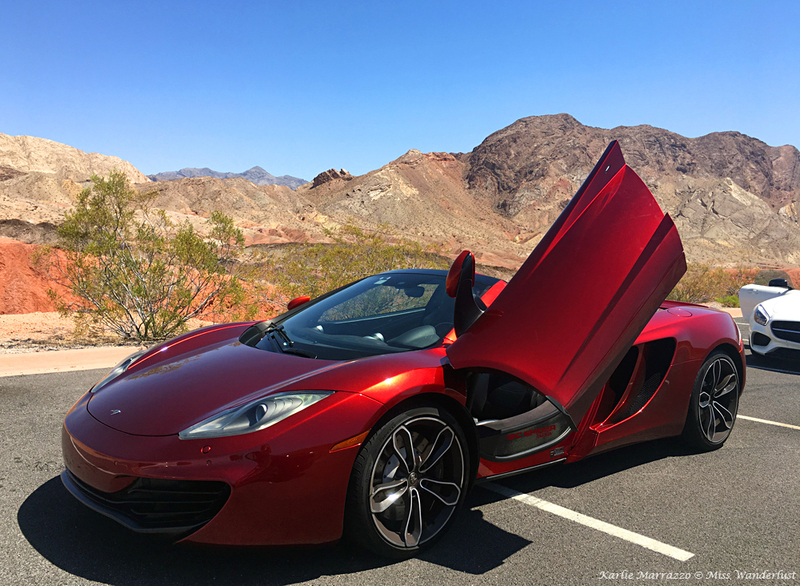 Woohoo, fast cars in the high desert my kind of experience. Great story, I feel like I was there myself. Oh what a dream come true! Way to go Karlie! This looks like so much fun!! And you take such good photos btw! This is something I have considered doing. Now I will consider it further. I am not a big car person but holy hannah does this look fun and probably the only way I will ever get close to a luxury car like this. Thanks for sharing. Wow! These cars are so damn awesome! 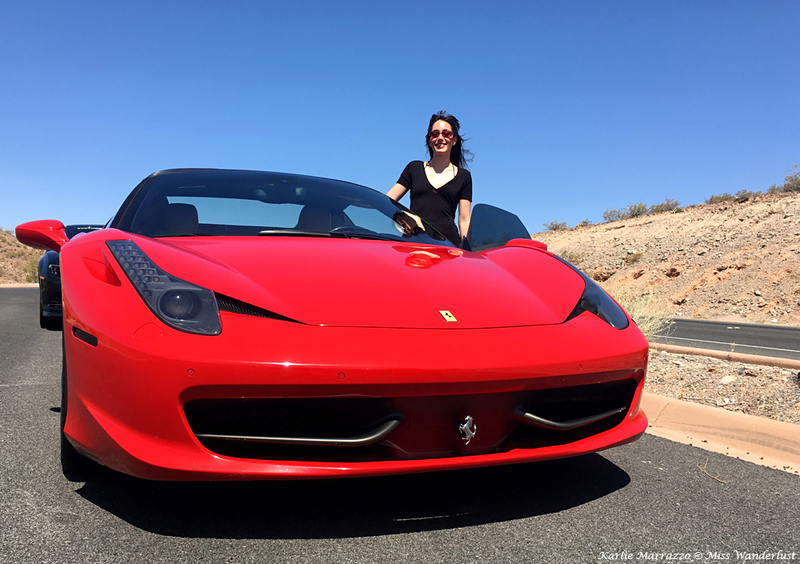 Looks like you had so much fun driving the ferrari! Looks like a lot of fun! I will have to take my husband for one of these experiences, he would love it. This is so cool! Haha literally got to be like in the movies for 30 minutes! I can’t imagine the adrenaline high! I’ve always wanted to do this ! You can do it in England but it looks much cooler to do it in Vegas ! Wow that looks like fun! 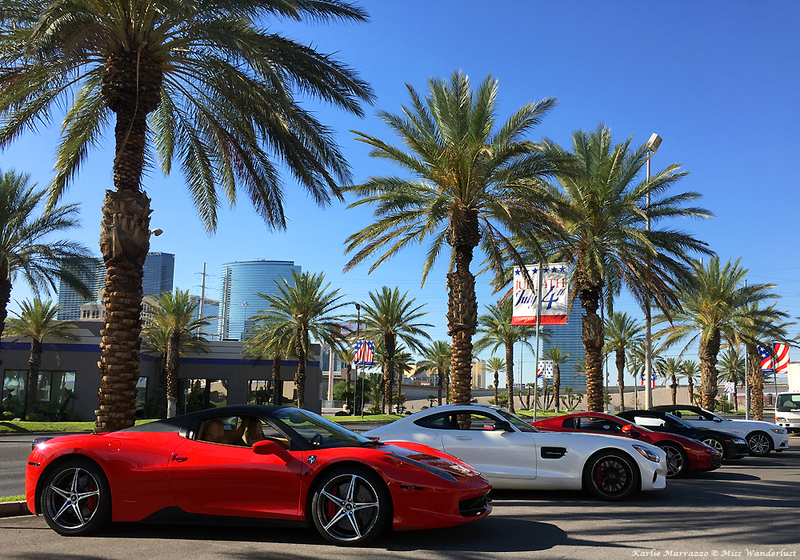 Las Vegas is the perfect place to try out those beautiful cars. Maybe I will try it on my next trip. I’m not even a huge car person and this looks so cool! I’d love to try this one day. Better start saving up now! It was the open road, girl! Wow, I’d love to take a spin in one of these beauties with my boyfriend through the desert! Aweome post. So Jealous! Would love to just be able to sit in that McLaren! Wow, Karlie. That looks like a LOT of fun! My OH would absolutely love this experience. Looks like a wonderful experience! I love the open road and this would be so much fun! Great job! HA! I’ve always wondered about this and now I read your post 🙂 It sounds like a great experience, am gonna have to try out now for myself!